Up to now our visit of the newly inscribed Medici properties in UNESCO’s World Heritage list has been in and around Florence. Now let us embark for other regions of Tuscany. 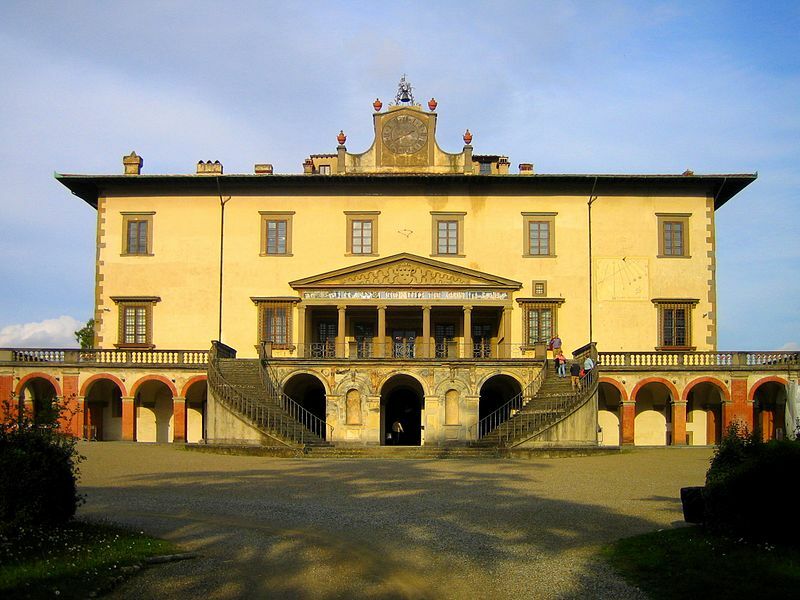 Villa Medicea di Cafaggiolo, in fact, is situated near Barberino di Mugello, north of Florence. It is one of the oldest of the Medici family estates, having been owned since the 14th century by Averardo de’ Medici, whose son, Giovanni di Bicci de’ Medici, is considered the founder of this great dynasty. Cosimo de’ Medici (the Elder) had the villa reconstructed in 1452 by the prominent Renaissance architect Michelozzo and soon the villa became the meeting place for some of the greatest intellectuals of the Italian Renaissance. In 1495, two brothers from Montelupo Fiorentino, under the Medici patronage, here started up the kilns for manufacturing the tin-glazed earthenware known as maiolica. 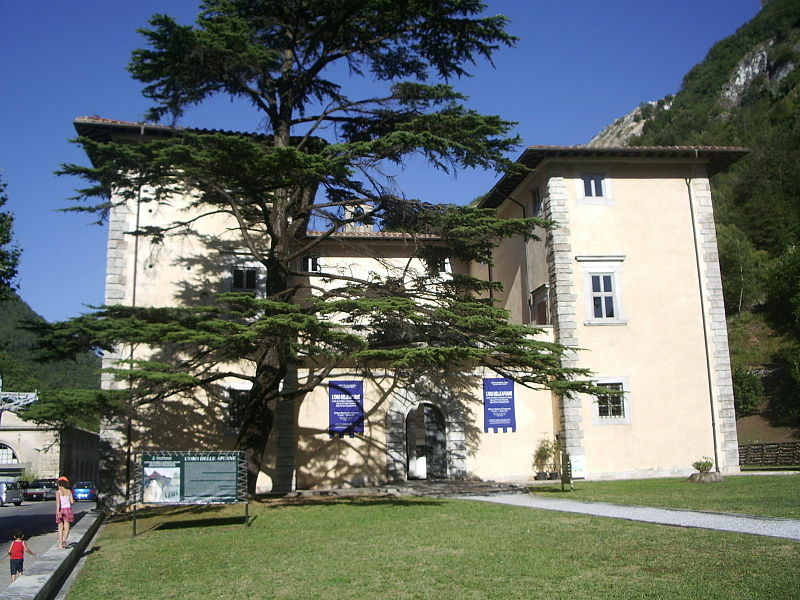 Located near San Piero a Sieve, also in the Mugello region, is Villa del Trebbio. 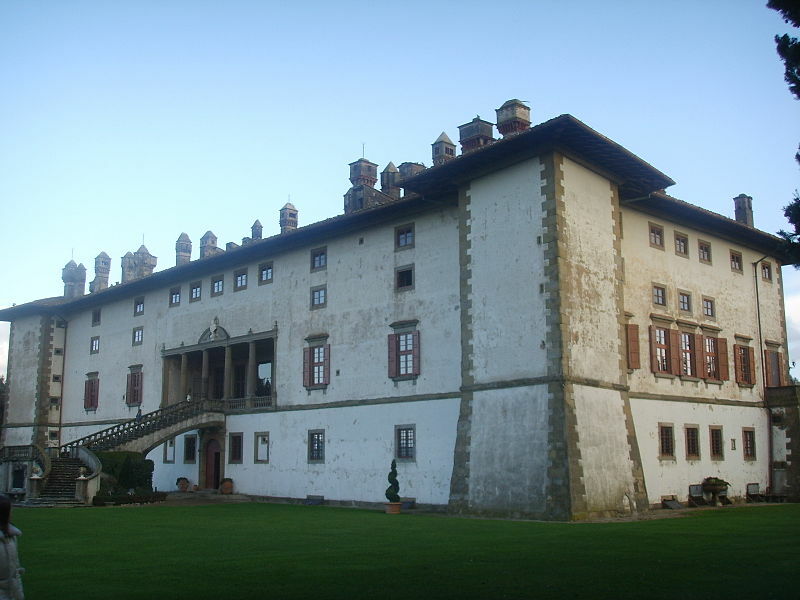 Probably the first Medici villa built outside Florence, the manor house is to be found on a strategic position dominating the Val di Sieve, near a crossroads (from which the Latin name trivium). Here too Michelozzo remodelled the villa, restyling it as a fortified castle, preserving the windowless tower, moat and drawbridge and adding a perimeter walkway with corbels. There was once a walled garden in which Cosimo de’ Medici loved to retreat; today’s garden, with roses and box hedges, was designed in the 20th century. Outside Florence, at Vaglia, on the road for Mugello is the Garden of Pratolino. 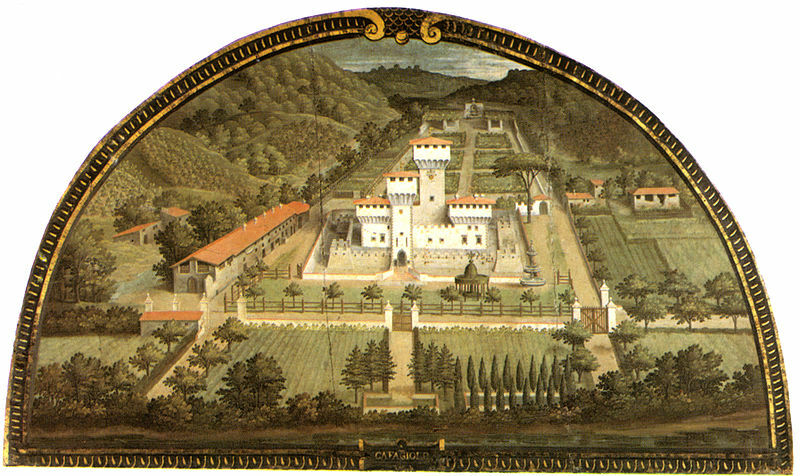 Once there was also a Medici Villa, designed and built from 1569 to 1581 by architect Bernardo Buontalenti for Francesco I de’ Medici, unfortunately demolished in 1822. In Francesco’s time the garden was a splendid example of Mannerism, with visitors, still today, walking under a cooling arch of fountain jets without getting wet. After Francesco’s death the villa and garden were deserted and in the 18th century many sculptures were removed to adorn the Boboli Gardens. In 1820 the garden was re-designed as an English garden and become one of the most romantic gardens in Tuscany. 50 years later the property was bought by Prince Pavel Pavlovich Demidov who restored the Paggeria, the pages’ lodgings, as Villa Demidoff di Pratolino. 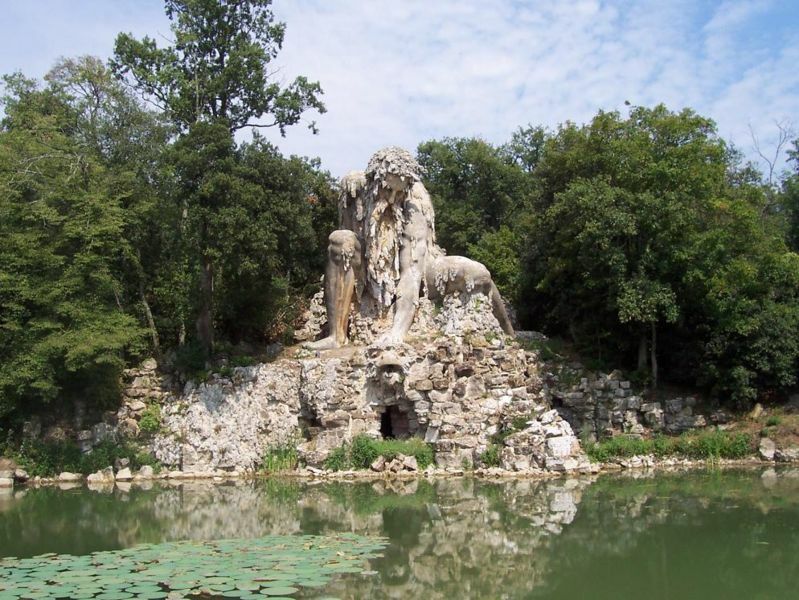 One of the most famous sights of the garden is the brooding statue of the Apennine Colossale, a huge sculpture by Giambologna (1579-1580) standing 14 meters tall, with the lower part occupied by a hexagon grotto from which, by means of a stairway, visitors have access to a room made out of the body and head of the statue and with the light entering through the eyes. 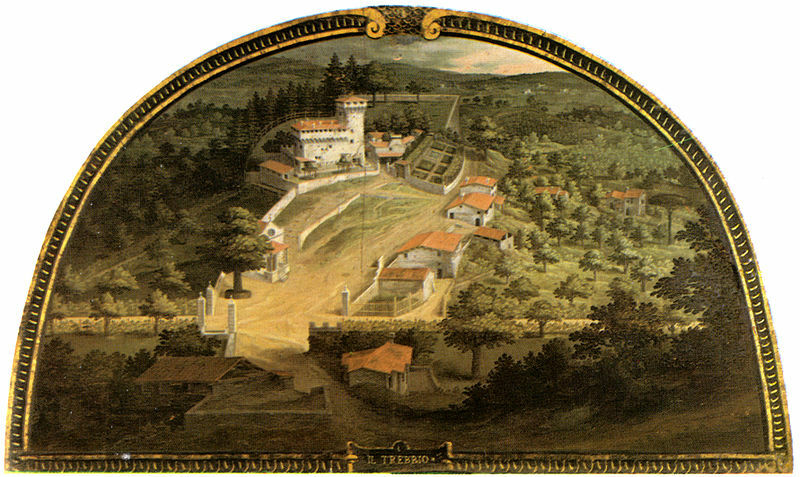 Towards the west of Florence, instead, located on a hill opposite the medieval hamlet of Artimino, in the municipality of Carmignano, is the Medici Villa di Artimino, also known as La Ferdinanda or the Villa of the Hundred Chimneys. Commissioned by the Grand Duke Ferdinando I de’ Medici, the villa was designed and built in 1596 by the architect Bernardo Buontalenti. Today the villa hosts conferences, wedding ceremonies and other special events, while the basement houses the Town Archaeological Museum. 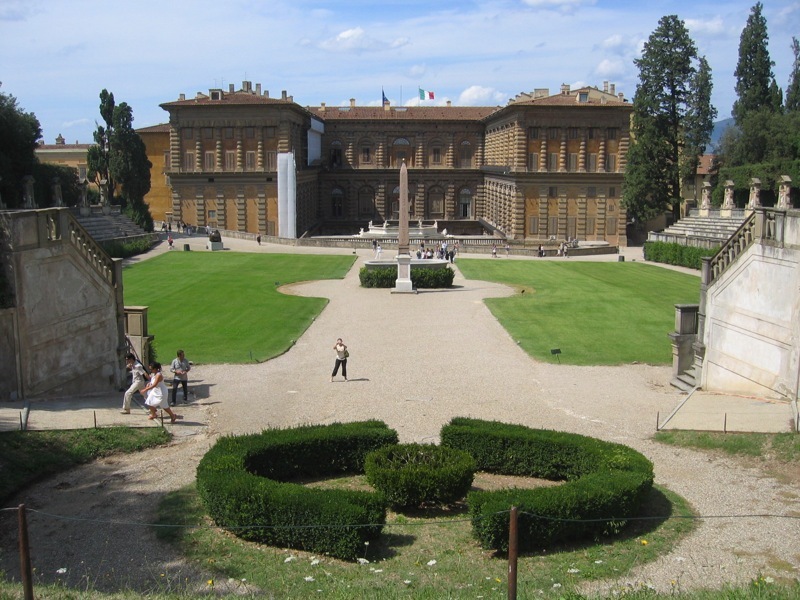 Further north, the Villa di Poggio a Caiano was built by Lorenzo the Magnificent at the foot of the Albano hills, between Florence, Prato and Pistoia. Building began around 1485; this time the plans were of the architect Giuliano da Sangallo and reflect the Humanist trend in architecture inspired by classical antiquity. The main hall is splendidly decorated with allegorical frescoes celebrating the Medici family, painted by Andrea del Sarto, Pontormo, Franciabigio and Alessandro Allori. Towards Pistoia, in the centre of Quarrata, is Villa La Magia another hillside strategic building. The villa was bought by the Medici family in 1583 who thought it doubly strategic since its hunting grounds bordered with those of the villas at Poggio a Caiano, Artimino, Ambrogiana and Montevettolini, like satellite villas around Mount Albano. Bernardo Buontalenti renovated it in 1584 embellishing the very simple quadrangular plan. 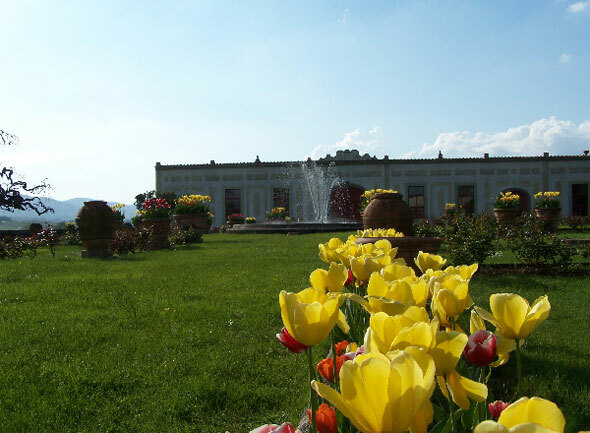 The Italian garden was created only between the 17th and 18th centuries by the Attavanti family. Today the Villa’s park hosts contemporary environmental art by artists such as Fabrizio Corneli, Anne and Patrick Poirier, Marco Bagnoli, Hidetoshi Nagasawa and Maurizio Nannucci. The farthest of all the villas and gardens is the Palazzo di Seravezza, sitting at the foot of the Apuan Alps, at just 8 km from the sea of the Versilia Coast. 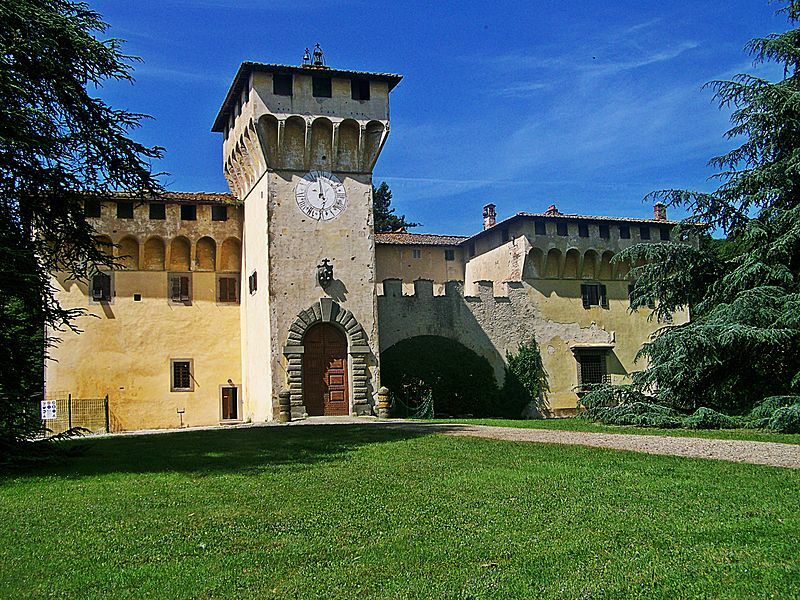 This villa was built by Cosimo I between 1560 and 1564 on the design of an unknown architect. Seeing the analogies with Villa di Artimino the architect is believed to be Bernardo Buontalenti. The area of Seravezza was strategically important for the dominion of Versilia and for centuries had been contested between the Republics of Pisa, Lucca, Genoa and Florence. For this reason Cosimo decided to build a defensive military outpost as one can guess from its solid, compact structure with slits. However, it soon became a leisure residence where the Medicis and friends would come to hunt or enjoy the lovely Italian garden. 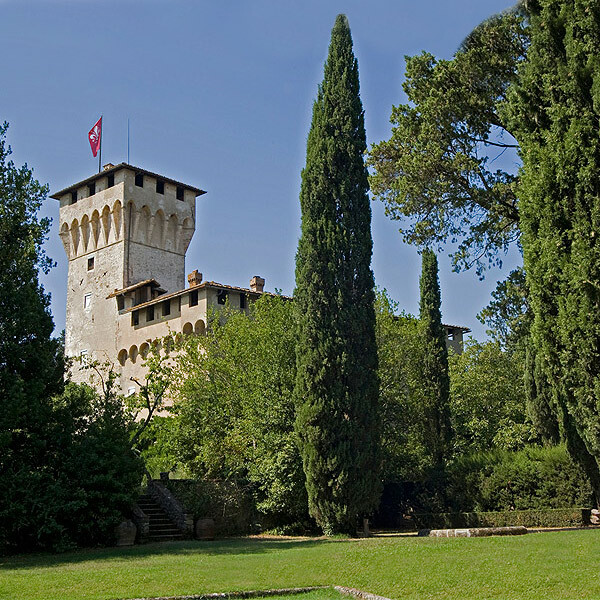 Since 1996 the villa hosts the Historical Versilia Museum of Trade and Folk Traditions. Here, briefly introduced, are the 12 Medici villas and 2 pleasure gardens recently inscribed in UNESCO’s World Heritage list. 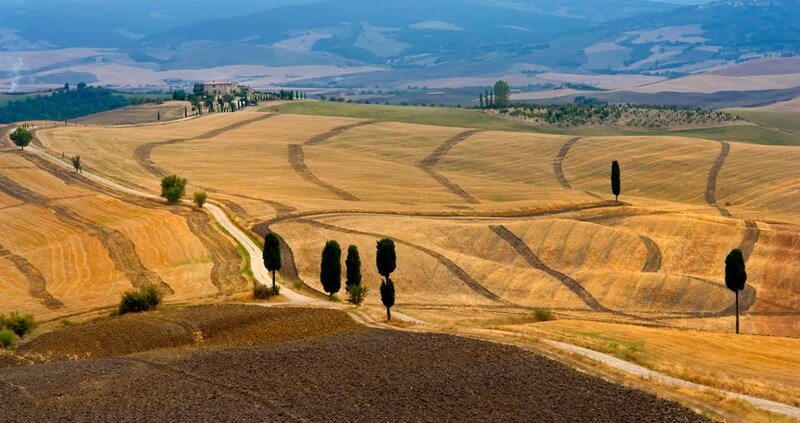 They go along with the other Tuscan towns and sites celebrated during the years by the same UN agency: the historic centre of Florence, the Cathedral Square of Pisa, the historic centre of San Gimignano, that of Siena, as also of Pienza, and the magnificent Val d’Orcia. What better acknowledgment of the magnificence of this region we love so much? Questa voce è stata pubblicata in Culture and accommodations in Tuscany, Tuscan lifestyle, Villas in Tuscany e contrassegnata con medici family, tuscan villas, Tuscany, world heritage list. Contrassegna il permalink.